Review by AllTheBestFights.com: 2016-06-11, fight not particularly good between Demetrius Andrade and Willie Nelson: it gets two stars. The former Wbo light-Mw champion Demetrius Andrade entered this fight with a perfect boxing record of 22-0-0 (15 knockouts) and he is ranked as the No.4 super welterweight in the world (currently the #1 in this division is Erislandy Lara). He fought just once in 2015 winning over Dario Fabian Pucheta (=Andrade vs Pucheta). His opponent, Willie Nelson, has a record of 25-2-1 (15 knockouts) and he entered as the No.12 middleweight. He lost to Vanes Martirosyan in 2014 (=Martirosyan vs Nelson) but then he has beat Tony Harrison (=Nelson vs Harrison) and Jonathan Batista. 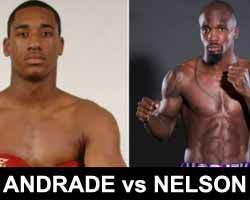 Andrade vs Nelson, WBC super welterweight title eliminator, is on the undercard of Ruslan Provodnikov vs John Molina Jr. Watch the video and rate this fight!